We love color! 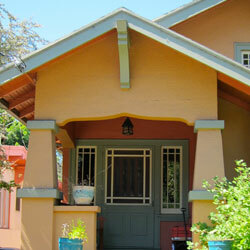 We work with clients to select colors for building and home interiors and exteriors. Trying to find the right color can be a trying and difficult process – choosing color is subjective. A color that works great in one room might fail miserably in another; some colors really work for some people, and others don’t. We take the time to test a wide range of colors to find the one that really suits the project and our clients. Our creative, patient, flexible approach allows us to tailor our services to what is needed, and to help our clients make informed color decisions.